Focusing on the actual holiday (that would be Thanksgiving) rather than the oh-so commercial Black Friday, Rotofugi is starting a new tradition – the ‘Giving Thanks Sale’ (through 11.27) featuring discounts on select toys including figures by Amanda Visell, Frank Kozik and more. Plus all domestic orders of $25 or more placed during the sale will receive free shipping. So with word of Black Friday deals pouring into the inbox, here’s a quick rundown of yet more ways to save on toys, art objects and more. 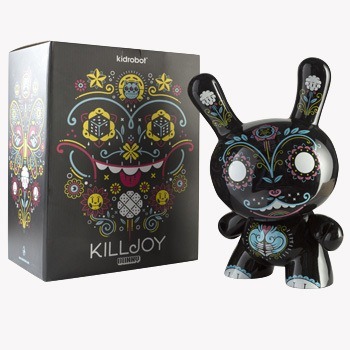 K.Olin tribu – 20% off all their porcelain toys with code ‘BLACK’ through Sunday 11.27. The Loyal Subjects – 25% off with coupon code ‘BF’ starting on 11.25 and running through 11.28. Vannen Watches – With checkout code ‘black40’ a whopping 40% off all items on vannenwatches.com from 12:01AM through 11:59 PM on Friday, 11.25. 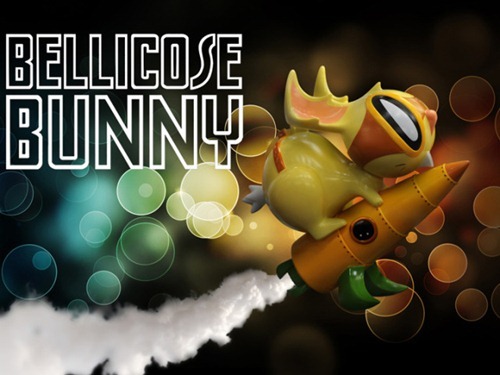 ToyQube – 5 Day Black Friday sale (through Monday 11.28) on select items. Ritzy Periwinkle – 10% off coupon code for ‘fans’ of her facebook page. Check out the return of her online store @ ritzyp.storenvy.com. Toy2R – Take 25% off any in-stock items at toy2rusa.com with coupon code ‘OCCUPYQEE’ through December 1st. 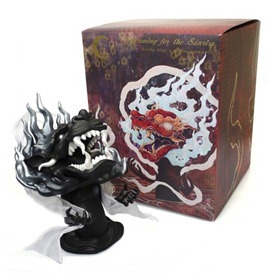 Spankystokes – Black Friday sale runs through Sunday 11.27 and includes discounts on all items including The Black Obsidian Ozomahtli from Jesse Hernandez for just $60. 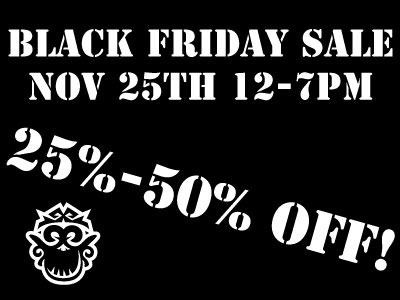 Munky King is offering two ways to get in on the savings with their one day Black Friday Sale – in store with discounts ranging from 25 to 50% off or online with the ‘BFDEAL’ coupon good for 25% off purchases made on 11.25 (some restrictions apply). For those out and about, definitely drop by the Melrose store to check out the deals and attend kaNO’s Dragon King signing from 2 to 4 PM. French brand Bonustoyz will open their ‘Black Market’ just in time for Black Friday @ 11 PM PST on Thursday, Thanksgiving Day (9 AM on Black Friday in Paris) While you might think this is just a clever name for yet another sale, it’s so much more. In an awesome turn, Bonustoyz is unleashing a wave of all-black toys. There are several new releases including Cody by Jon Knok, Holybrikus by Mist, Kosplay by Ajee as well as rare items from the archives including black Goldorus and Orus from Mist, Black Copper, Inkhead Aro and Uninkhead by Steph Cop as well as a very small number of black Skullskins. As a bonus, expect friendly prices which also include free worldwide shipping. If you’re looking to add to your ‘Black’ shelf, you’ll definitely want to check this out. Tis the season for saving. 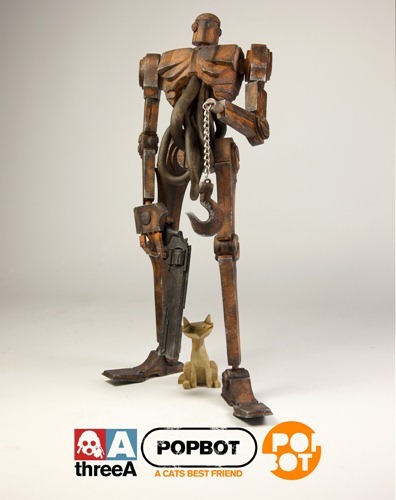 De Korner has taken the wraps off their Holiday Sale featuring select toys from 3A, Kidrobot, Munky King and more at up to 50% off. The selection includes several recent blind box releases from KR as well as a large number of 3A retail editions. The holiday sale is on now and continues through 12.24. Happy shopping. Ah… the holidays are upon us. Turkey, Stuffing, Cranberry (no thanks!) to satisfy your stomach and plenty of Black Friday deals to satisfy your shopping gremlin. Myplasticheart has your holiday shopping covered. 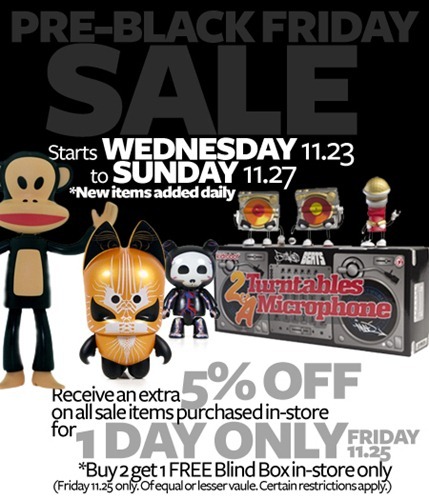 First up is its annual ‘Pre-Black Friday Sale’ (11.23 – 11.27) offering deep discounts on specially marked sale items. If you’re in NYC, drop by the myplasticheart brick ‘n mortar for an additional 5% off on Black Friday itself as well as a buy 2 get 1 free blind-box offer (some restrictions apply). Be sure to hit up myplasticheart.com on Wednesday to check out the deals. But wait… that’s not all ;-) MPH is also offering several Holiday Gift packs (Bundling, for the win!) for extra savings as well as their Holiday Gift guide – which we don’t think our on-the-ball readers will need, but hey it might give you a few ideas.